Okay, so a quick finish up of my vintage and antiques sewing machine review BEFORE I move on to the two new-to-me vintage machines that have arrived at my house! This is number 14, a Singer Slant-O-Matic 500A which I've had for several years. I've blogged all about this machine a few years ago, and you can read more about this futuristic looking beast right here. I am the very proud owner of my maternal grandmother's Singer Slant-O-Matic 500A. 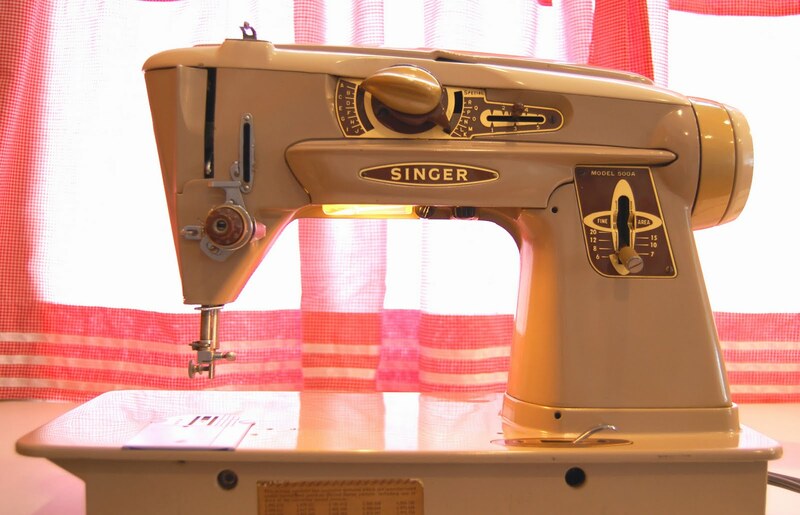 It is the machine that she taught me to sew on when I was 5 years old. I am now showing my own granddaughter how to sew on this machine. I wouldn't trade it for anything, sentiment aside. It's the nicest machine I've ever sewed with. Pam, that is a fantastic story, I love that your Rocketeer is a family heirloom! I hope you and your granddaughter enjoy stitching with it for years to come. I'm a little confused here. Pam says the machine was her maternal grandmother's. So, her grandmother? and she's now teaching her own granddaughter? All in the space of the 63 years (at most) that this machine has been in existence? That's 5 generations in 63 years? Am I reading that right? In response to Steven: the Singer Rocketeers were made in the early 1960s. If Pam was five years old in about 1960, when she learned to sew on her grandmother's machine, then she was born about 1955. In 2014, when she wrote this post, she'd be in her late 50s. That is plenty old enough to have a granddaughter as old as ten or twelve years old. You have to figure into the equation that her grandmother was probably already a grandmother when she bought the machine - Pam didn't say her grandma had owned it since she was a young woman. Works for me. I love my Rocketeer! It took some time to find, then some months to clean her, and re build the tension, but she runs smooth and quiet now.